Time and again, you will find yourself greeted by unforced smiles and heart-stirring songs of welcome. If you’re travelling with children they will be treated like tiny celebrities. In a world where busy schedules and technology dominate day-to-day life, such natural friendliness can feel like the most precious gift of all. When you come to Fiji you’ll find this human warmth is matched only by the beauty of the environment. With 333 tropical islands and a huge choice of accommodation options, there’s something here for every holidaymaker. Families are very well catered for. Fiji’s all-inclusive resorts range from sophisticated five-star brands in locations such as Denarau, to one-of-a-kind hideaways on their own private islands. With kids’ clubs and a dazzling array of water sports and activities on hand, your younger family members will enjoy every minute (while you enjoy the fact that they’re having fun in a safe, supervised holiday environment). Time and again, you will find yourself greeted by unforced smiles and heart-stirring songs of welcome. Contrasting with these family-friendly properties is another kind of resort – the couples-only retreat. Often set on heartbreakingly beautiful islands, these boutique properties specialise in tranquil luxury. You can expect private villas, fine dining and high-end spas to be standard to most packages. The goal is top quality one-on-one time, with all mundane concerns taken off the table. 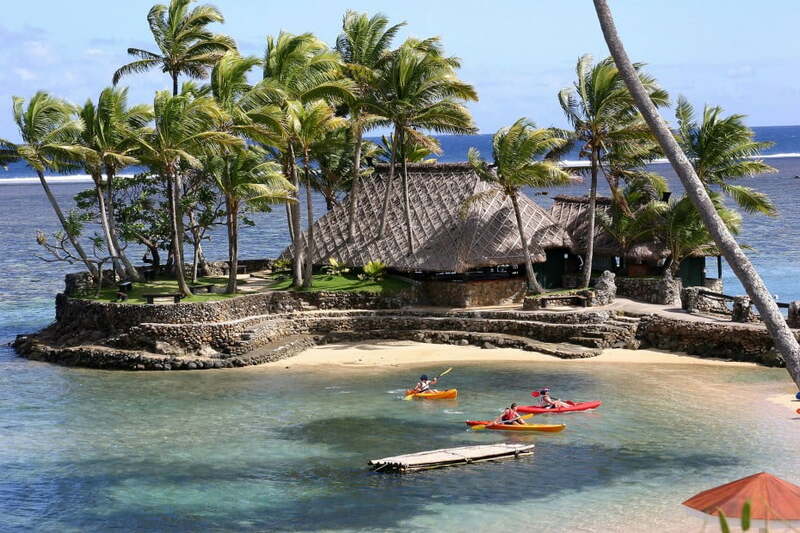 This brings us to another of Fiji’s specialities – the destination wedding or honeymoon. Exchanging vows on your special day becomes even more romantic when the wedding party is gathered on a stunning beach at sunset. Imagine torches flickering and soft music playing as you walk barefoot through the sand towards the assembled well-wishers. A unique occasion, made even more memorable by the setting. Later you’ll share a feast – it’s highly likely that it’ll feature seafood caught that morning. Island weddings like these keep stress to a minimum and often these resorts offer a wedding planner who can stage-manage the entire event.